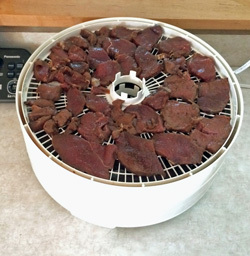 Successful hunting leads to successful cooking and that even includes freshly made jerky! Using some of the venison from my deer this year I made 8 trays of jerky which I have packed in food saver bags and used for some Christmas gifts. I’m also bringing some to a south Florida family get together. Making jerky is not difficult. In fact, it is easy. It does take some time though. I like to muscle out the meat and carefully trim it before slicing. Then it goes into spice and marinade before laying on the trays. Click on the photo to go to a website with some great venison jerky recipes. Since it is the holiday season and many people are getting ready for Christmas I thought you would enjoy seeing how nice and easy it is to cruise back in the woods, find the perfect tree, load it on your New Holland Rustler and head back to the house. That’s what Paul did with his daughter Veronica. Instead of having to try to get a truck to a tough place or dragging with a 4-wheeler these utility vehicles really are loaded with “utility.” A nice fresh tree, undamaged, is now decorating their homestead! 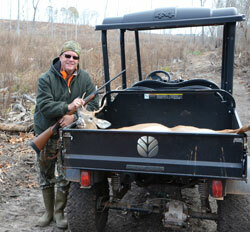 I’ve been waiting to show you how easy a New Holland Rustler makes deer pickup. On my last two days of deer hunting I got a 4pt. buck. I was able to drag him to the firebreak around the property which is wide enough for 4-wheelers and utility vehicles. Then I walked back to where the Rustler was parked and with my nephew Joe and brother Paul we picked him up and got him hung up in a tree back at camp. We had to cross a creek and put some boards over it thinking we might need them. But I didn’t stay on them and we still drove right across. This Rustler 4-seater has a long base which allows the front tires to get across a space like the creek and just keep pulling away since it’s also 4-wheel drive! I still did a lot of walking on this hunt but having a Rustler nearby is very handy. If you’re interested in this beast of a machine you can find out more about them on the website or at your local New Holland dealer. Cheers from camp. We spent another couple days at the CPHC this past weekend and I was lucky to get a four point buck. While getting him processed into the cooler we took a time out. The time out was to try something new that came to my attention recently and I was sent a sample of it – Organic Ocean Vodka. This Hawaiian product is made from organic sugar cane in Maui. 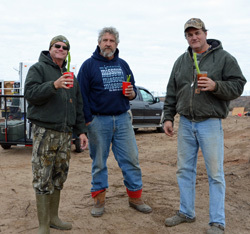 To go along with it I came across some locally made bloody mary mix at a downtown Pensacola outdoor market before heading to camp – Vicki’s Wicked Potions “Bloody Brew” which is called “evilicious” and made with creole spices. Wow. Mmm good. Here’s where you can find Ocean Vodka near you. You can expect that since we not only love to hunt but to eat and enjoy a good beverage that you’re going to be finding some ideas on these subjects as well. For more than seven years, the Smith Family has worked diligently to bring their special Ocean Vodka from the Island of Maui to the far reaches of the world. The opening of a new craft distillery for public tours and tastings on their 80-acre organic farm is a dream come true for the family’s mission: to create a superior, organic, value-added agricultural product from Hawaii that supports the local economy, competes globally on quality, operates with environmental responsibility and raises awareness for oceanic conservation. Ocean Vodka is the only spirit in the world distilled from organically farmed sugar cane, blended with deep ocean mineral water and powered by the sun. Certified USDA Organic and 100% gluten-free, Ocean Vodka uses a proprietary column distillation process to produce an ultra-clean, award-winning spirit. This pure refined spirit is blended with deep ocean mineral water, sourced from a depth of 3,000 feet off the Kona Coast of the Big Island, to make Ocean Vodka. Minerals Calcium, magnesium and potassium, which naturally occur in ocean water, give Ocean Vodka a unique, mineral-rich flavor found in no other vodka. These minerals create a pleasant, distinctive taste and enhance flavors when Ocean Vodka is mixed with fresh juices.